Department of Chamber Ensemble as an independent unit, created in the 60’s. It can be considered the progenitor A. Derkach. Worked in class chamber ensemble M. Bauer, B. Desyatkin, Yu Skovronskyy 3. Shahidzhanyan. Graduates of the school, whose follow-up was closely linked to kameralistykoyu: IV Pole, F. Goldstein, T. Lahola-Babiak, J. Moskvit-Savko, G. Sterniuk-Levitsky, A. Sechenova V. Lapsyuk ( prof., PhD. Mist. 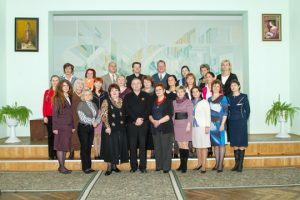 ), A. Panasiuk-Bonkovska, A. Tchaikovsky (prof.), A. Vankovych-Kogut (prof.) ZH- Parhomovska, R. Zalsska (prof.), T. Shup’yana (prof.), N. Marynyak, X. Humetska (Assoc. ), T. Dem’yanchyk (Assoc. ), V. Andrievska (Assoc.) T.Slyusar (Assoc.). For many years, there is a school chamber orchestra under the direction of the same Hunevych who has spoken at various concerts and events in Ukraine and abroad. In kontsertmeysterskomu grade school is the first stage of preparation of future pianists to work with musicians of other specializations – singers, instrumentalists, choir, made of sheet reading skills. As an independent unit kontsertmeysterstva school department was created in 1992 and its first head was the Honored Artist of Ukraine, prof., Head. Department kontsertmeysterstva LNMA them. Lysenko J. Matyukha (graduate school). Employees of the department are also highly concertmasters, illustrators, including the Honored Artist of Ukraine, soloist of Lviv Opera O. Lykhach; laureate of international competitions L. gift Ensk; Lviv Philharmonic soloists Kostruba L., V. Rybchuk, A. Kalyuzhna; violinists O. Nastyuk 3. Sorokivskyy. For many years the department worked Honored Artist of Ukraine, soloist of Lviv Philharmonic Hidchenko B., N. Ruden- Co., Vladyslavskyy V., E. Romaniuk, B. Kissel, V. Matviyiv, Yu Trytsetskyy. Many times in concerts department participated Folk Artists of Ukraine Pyatnychko S., L. Bozhko, R. Witoszynskyj and instrumentalists Alexander Pavlenko (flute), A. Miller, L. Kurach, B. Nazar (violin), A. Skovronskyy (cello). Teachers of the department held many events: concerts to the anniversaries A. Kos-Anatolsky, Tchaikovsky, Krushelnytska, Lysenko, John. Verdi, A. and N. Nyzhankivskyi, Mozart, Chopin. Each year, a concert organized by the department of works by Ukrainian composers, thematic concerts and cool evenings of chamber music as part of scientific conferences and seminars, including “Early Music repertoire pianist-accompanist”, “The development of art in daily classical accompaniment.” Many times the best students in the ensemble of soloists-illustrators took part in a concert of school. Established close contacts with the department chair kontsertmeysterstva LNMA them. Lysenko. In 1998, the Department kontsertmeysterstva held scientific seminar “Some problems of kontsertmeysterskoyi” and in 2008 – Regional scientific-practical conference “Theoretical and practical aspects of piano accompanist.” In 2000 a group of authors, which included professors J. Matyukha M. Makar, Leonid Nikolayev and off. C. Hurhanova, developed a program of kontsertmeysterskoho class for secondary special music education institutions. J. Matyukha holds annual workshops. The Department kontsertmeysterstva LNMA them. Lysenko working graduates, professors Babynets N. and M. Makara; candidate. Mist. Assoc. M. Lipetsk, A. Ksondzyk; soloists Kryzhanivsky illustrators M., A. Ohrid-Zinko, S. Kanchalaba-Shvaykovska (violin). Many graduates – concertmasters LNMA them. Lysenko. This laureates of many national and international competitions Yuri Soloviev, J. ParhoMovska, L. Tsats-Kuzhel, AN Zaikin, Yuri Vaf’ya. A. Butorin, Kiva, O. Yurchenko, Durkot I., O. Osmolovsky, N. Bahdasaryay, A. Kulincheyko, R. Gutsulyak, N. Pelech, pockmarked A., R. Kotlyarevskogo V. Vislyanska-Bilevych, GA Radchenko-Pristupa A. Pashuk A. Mogilev, A. Sawka, N. Velichko, Ivan Nikolaev, Yu Makivnychuk, R. Protsiv A. Zholubak A. Lemekh, Mr. Dougan. Kandy. Mist. N.Vakula and T. Milodan kontsertmeystersku combine work with educational and scientific activities.